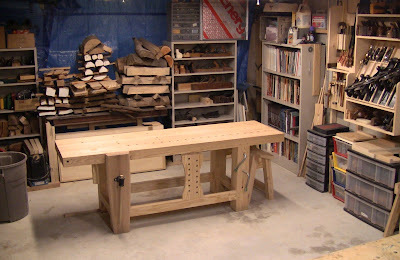 The main work area: Roubo workbench, with all tools just a few steps to the right. So far I've found this layout very convenient. Schwarz sawbench tucked under the bench overhang. Wow, when I said workshop reorganization was a popular topic, I didn't realize just how popular! I posted a couple pictures of the tool wall to several forums, and within 5 days had visits from 49 states (Hawaii didn't visit until today) and 46 countries. There were 1653 visits total, with 2167 views of the workshop reorganization pages. People also stayed to look at other pages: there were 6193 total page views during this period; I crossed the 10,000 mark in 5 more days. So, yeah, it's a popular topic! I've spent the time since then getting the rest of my shop in order. Now the photos can pull back to show it all (notice how tightly-framed the other photos were!). It was cluttered and disorganized. Now it's clean and tidy, a comfortable place to work, with everything accessible. I also took the last Big Step. I moved my Shopsmith out of the shop, since I haven't used it for the past two years. 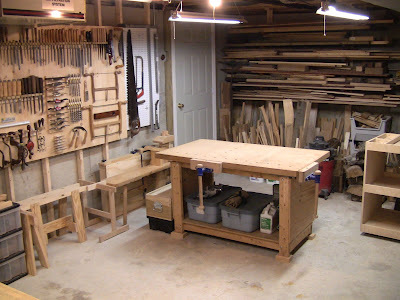 There are a still a few power tools accessible: the small Shopsmith bandsaw on a power stand, a mini-lathe, a benchtop planer, and a couple of drills. But except for the lathe, these are now backup tools, for those times when I just have too much lumber to work by hand. 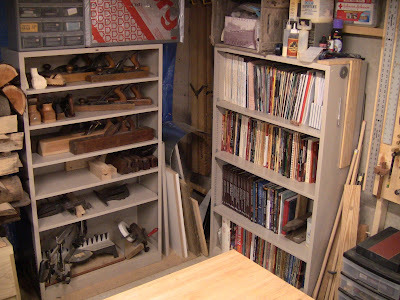 All the other power tools and accessories are in the other part of the basement or buried in the workshop cabinets. I no longer care about accessibility for them, I just want them out of the way, making room for hand tools. 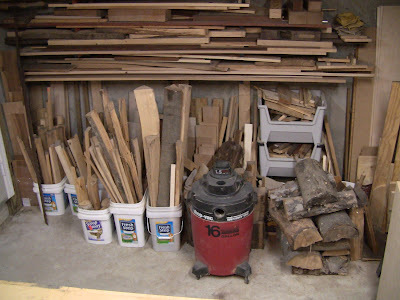 As I was consolidating and rearranging things, that was my guiding principle: if it's not contributing to my hand tool work, move it into the background. Or just get rid of it. As a result, I actually have a bit of open shelf space. Granted, I boxed a few things up and piled them high to clear space, but that allowed to have all my planes of all different types out and accessible. My lumber supply was a big problem. I have a lumber rack, but it was overloaded. The scraps were spilling all over. So I gathered up 3 burn barrels worth that we'll use in the outdoor fireplace this summer. I hate to waste scraps, so this will at least get some thermal value out of them. There are still plenty of usable scraps for project bits, but now they're under control. I stood some of the lumber up against the basement stairwell, resting the ends of the longer pieces against the joists overhead. I've had some of this stuff for over 25 years. Some of it I bought last year from a guy who was selling his home; he was as bad as I was, he'd had it for 30 years! Between the two storage areas, the lumber's now reasonably accessible, and I can pick pieces out without it all coming down on my head. I need to focus on some projects to use this stuff up. It was a big job, but I just took it an hour or two at a time. That was valuable shop time, but the results are well worth it. 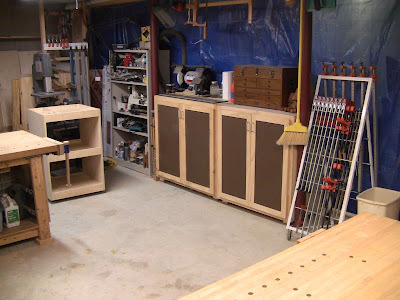 My shop is only 16'x24', but clean and organized, that's quite roomy for hand tool work. As with any basement shop, it still retains a bit of the dungeon feel, with bare concrete and exposed joists, wiring, ducts, and pipes overhead, but it's a much more pleasant dungeon. And not tripping all over crap scattered about? Priceless! View entering the workshop. 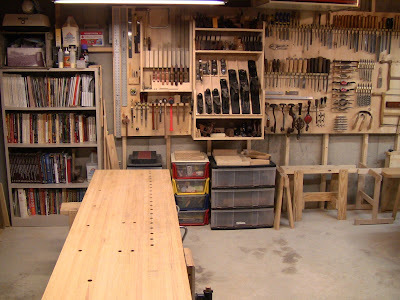 Additional sawbench and sawhorses to the right. At some point I'll replace those plastic drawer units with some wooden cabinets. 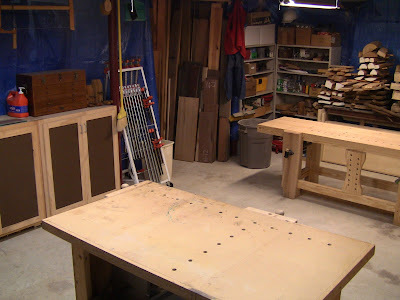 My old workbench, made of 2x4's, plywood, and MDF. Now it makes a good glue and assembly bench. The lumber rack is on the far wall. Cabinets and rolling clamp rack. The rolling cart is next to the assembly bench. I removed the chisel racks from it and cut off all the Shaker pegs. It's no longer storage, instead it's back to it's original role as a temporary place to hold tools and workpieces as I work, keeping the bench surface as clear as possible. View from behind the assembly bench. These shelves hold all my extra wooden and transitional placnes, as well as books and magazines. Miracle of miracles, there's still a bit of unused space! 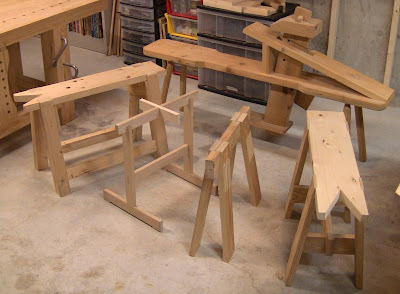 The workshop helpers: old and new Schwarz sawbenches on the ends, Krenov and Underhill sawhorses in the middle, and Langsner shave horse in the back. 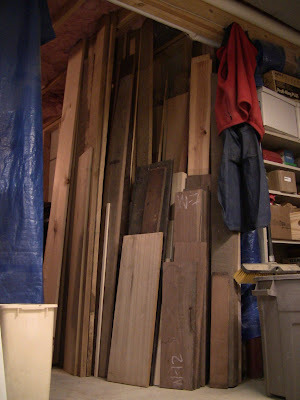 The overflow lumber storage at the basement stairway. A number of comments in the forums jokingly suggested that my shop was too neat to be allowed, but I can say unequivocally that no work space of mine has ever been this nice. I have the tools, I have the shop, now I have no more excuses, time to get busy making stuff! Well, all I need is time. Here's a quick little video tour of the shop. It doesn't really show any more than the photos, but it might give you a better idea of how it all lays out. The proof that this is indeed just a small shop is in the fact that I couldn't get back far enough from any vantage point to take much in; the camera lens just isn't wide enough. Great post and nice shop. Like the short video clip. The shop Look amazing. Love how well organized it is. I'm planning out my new shop space for when I move in a couple of months and you have inspired a great many ideas in my little mind. I think some of these ideas can even be well applied to my little shop I work in now. Amazing! What an awesome repertoire of hand tools!! What city do you live in? Thanks, Caleb! I'm in the Boston area.